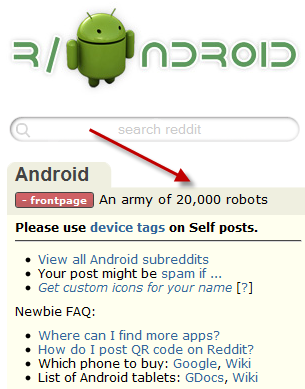 Android Community Keeps Growing - Reddit.com’s Android SubReddit Now 20,000 Strong! We couldn't help noticing that as of a few minutes ago, the Andreddit community reached a nice, healthy, round number 20,000. What this means is 20,000 of you clicked the little button from your reddit accounts and are regularly getting Android stories mixed into your front page. You have helped a lot with our continued growth and have proven yourself as a great source of news, readership, and participation. In fact, some of you even went as far as joining our ranks - Brad Ganley and Brett Gmoser, we're looking at you (the door is always open for more). /r/Android, we wish you to remain the great community you are today for years to come.